Sound bath therapy has been slowly picking up traction among urbanites across the globe and is becoming an increasingly go-to option for mental therapy. 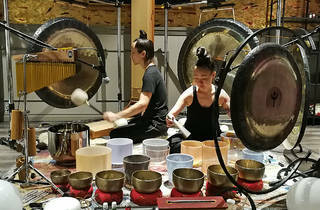 Typically an hour-long, sound baths involve a sound healer who operates multiple instruments like Tibetan singing bowls, crystal bowls, gongs and chimes while you (or a group) get some shut-eye and hope you wake up with a less cluttered mind. Of course, that’s just the essence of what a sound bath is, so we spoke to Lou Eu and Arjun Devi – founders of Alchemie Boutique (a sound bath therapy centre), sound healers, yoga practitioners and instructors – to find out more about the therapy and how it works. ‘Yes, the practice of sound healing has its roots in Tibetan culture but it’s not exclusively Tibetan,’ says Lou. ‘Every culture has their own form of sound therapy – South American priests use drums, in Asia the conch, and here in Malaysia, gongs or gamelan.’ That being said, modern sound bath practices in general still include Tibetan singing bowls and gongs in a typical session. Contrary to what its name suggests, you’ll be dry throughout your session. According to Devi, the reason the treatment is called a sound bath is because you’re ‘submerged’ in sound and vibrations. The treatment is also supposed to cleanse your mind of clutter – memories and thoughts that affect you negatively; by the end of the session, you’re left with a ‘clean’, stress-free mind. ‘Each person has his or her own ‘vibrations’, or vibes, which are produced by our thoughts, our mental state. By playing particular tunes with the gongs and singing bowls, we introduce to the body different vibrations that help ‘knock’ a person’s current vibes and help tone down their rhythm, which in turn has a calming effect,’ says Lou. He adds that with the right vibrations, sound baths can also help inspire passion and willpower. According to Lou, each instrument has its purpose. He uses various gongs that represent different elements to handle turbulent minds. 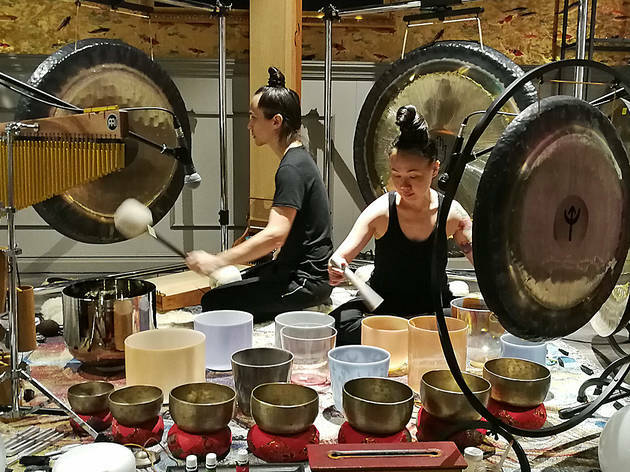 For example, the ‘water’ gong produces a mellow hum that has a long resonance, which helps participants find peace; while the ‘fire’ gong rings out sharply inspiring passion. Lou also uses a gong that’s embossed with the shape of a heart to relieve anger and hate. ‘These gongs and bowls are made to specific measurements, so they produce certain tones,’ says Lou. ‘It’s important that we use the instrument with the right tones and vibrations to treat different problems,’ adds Devi. A typical hour-long sound bath session would require you to lie down and relax so that the sounds can work their magic. But at Alchemie Boutique, Lou and Devi use suspended hammocks or ‘cocoons’ as they call it. Devi says this is to provide a ‘womb-like’ environment, which allows vibrations to surround the body more effectively. Although it’s common for participants to completely doze off, it doesn’t matter if you’re awake throughout your session. ‘Regardless of whether you’re asleep or not, you’re still affected by the sounds because, again, it’s all about vibrations,’ says Lou. Sound healers will bring you to the mental state you need to be in; like a sonar detector, they can base their diagnosis on the returning vibrations and sound resonance during the session. Sound bath therapy sessions available through Alchemie Boutique; get in touch or book a session through their Facebook page. From RM85 per person. Scientific Sound Asia, programmes run at The Violet Flame KL, 7 Jalan Riong, Bangsar (03 2282 9868/scientificsoundasia.com).